With the MLB trade deadline quickly approaching the Cleveland Indians are looking to make a move once again. The MLB trade deadline is July 31st at 4 p.m.
Last year around this time the Indians attempted to make a move for catcher Jonathan Lucroy which failed but eventually landed Yankees relief pitcher Andrew Miller. On Thursday a report came out by an executive reporter for MLB.com, Mark Feinsand. Source: Indians looking for bat, either OF or INF. Bruce & A. Cabrera make sense, but 2nd source says "nothing serious" between Mets/Tribe. Asdrubal Cabrera played with the Cleveland Indians from 2007-2014 and also made his MLB debut with the team. In 77 games this year Cabrera has hit .260/.342/.409, has 73 hits, 15 doubles, 9 homers, and has 30 RBIs. If the Indians do decide to make a move for Asdrubal you have to assume he would play behind Jason Kipnis at second base and Francisco Lindor at shortstop. The other player linked in this report is Jay Bruce. For the majority of Bruce’s career, he played with the Cincinnati Reds until getting traded to the Mets before last year’s trade deadline. In 94 games this season Bruce has hit .262/.325/.521, has 98 hits, 19 doubles, 26 home runs, and has 70 RBIs. If Cleveland acquires Bruce he should provide the lineup with a bit more power. One would have to think that if the move did occur for Bruce that the Indians may have to trade away Carlos Santana though. 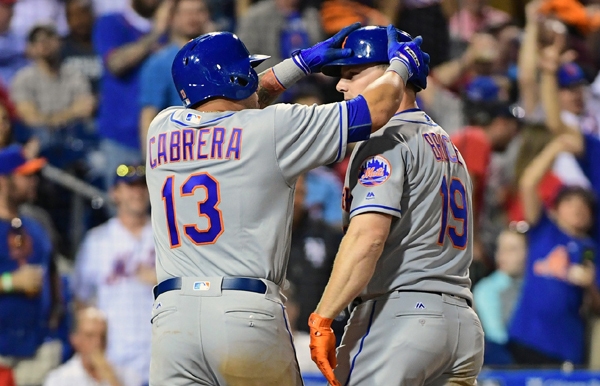 Remember though that Jay Bruce and Asdrubal Cabrera may not be heading to the team though. A second source did say nothing serious has been negotiated between the Mets and Indians…yet.